Country Parish Music | The Goose Is Out! Country Parish Music are Steve Collins and Rosemary Lippard. The Goose saw them first at Leigh-on-Sea’s Midwinter Folk day, and were so impressed that we just had to book them! Goose regulars will know Rosemary well from our Singarounds and club nights, and she has also supported Martin Carthy & Dave Swarbrick and Ewan McLennan at our Ivy House concerts. Country Parish Music is the new project from former Owl Service/Rif Mountain main man Steven Collins. 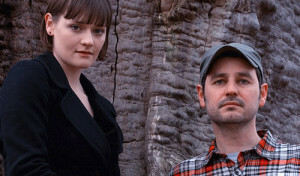 The Owl Service split at the end of 2012 and Collins fledged the Rif Mountain collective at the same time – only days later he discovered Welsh singer Rosemary Lippard and the pair formed Country Parish Music soon after. The sonic palette of Country Parish Music remains firmly in Owl Service territory, but the overall sound is more refined with a greater sense of direction. Lippard’s striking voice lends purity and clarity to the material making it accessible, while Collins’ considered touch with instrumentation and tasteful production give the music a heaviness that aligns the band closer to the mavericks of ’60s and ’70s folk (Pentangle, Trees, Fairport Convention mk3, Steeleye Span mk1) than the current crop of mainstream folk acts. “Studio-based project led by former Owl Service main man Steven Collins and singer Rosemary Lippard. Their songs focus around the British folk tradition (and occasionally beyond) but as with the music of The Owl Service they bring a very refreshing and innovative approach with their interpretations that leave you wanting more. Click here to find out more about Country Parish Music! Click here to hear Country Parish Music sing Lord Lovell!